Shareablee, a social media analytics and intelligence company, announced a pivotal ranking system for media companies in the US. U.S. Media 100 IndexTM ranks top U.S. media companies based on their video impact and audience engagement. The index’s foundation is Shareablee PowerRankings™, the all-new social media cross-platform rankings product available within the Shareablee platform. The U.S. Media 100 IndexTM is the cornerstone of the Facebook Media Solutions partner’s next generation “Measure and Monetize” suite, rolling out throughout 2017. The rating will help brands to monetize and value their social audience, keeping pace with content experiences and stay relevant and engaging for today’s digital-first consumers. 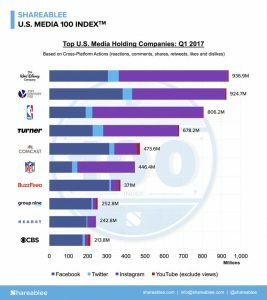 The U.S. Media 100 IndexTM accounts for 70% of all consumer engagement and 76% of all video viewing in Q1 2017 across brand content on social media. Shareablee’s U.S. Media 100 IndexTM represents the most influential and powerful U.S. media organizations and the share of consumer attention, time and overall enthusiasm each company owns when it comes to entertaining, informative and valuable video experiences. Shareablee’s PowerRankings™, rated as the world’s first true social audience-centric metrics stack for B2B marketers, researchers, influencers, agencies and brands to quantify their cross-channel social media campaigns. U.S. Media 100 IndexTM is an extension of this proprietary technology that is powered by Shareablee’s very own C.A.S.T.TM (Census-based Advanced Social Taxonomy). Create the first holistic view that enables marketers, agencies, and researchers to evaluate social media audiences like web and TV audiences. For the first time, you have real visibility into your true unique audience across multiple social pages and platforms, and can benchmark against your competition, rather than simply counting “likes”, “followers,” and “pins”. Shareablee’s investment in measuring the unified consumer intersects all aspects of media measurement. As a member of the Microsoft Big Data Alumni class, the C.AS.T.TM builder has continued to make advancements in its usage of next-level technologies and machine learning to better shed light on human values and preferences. 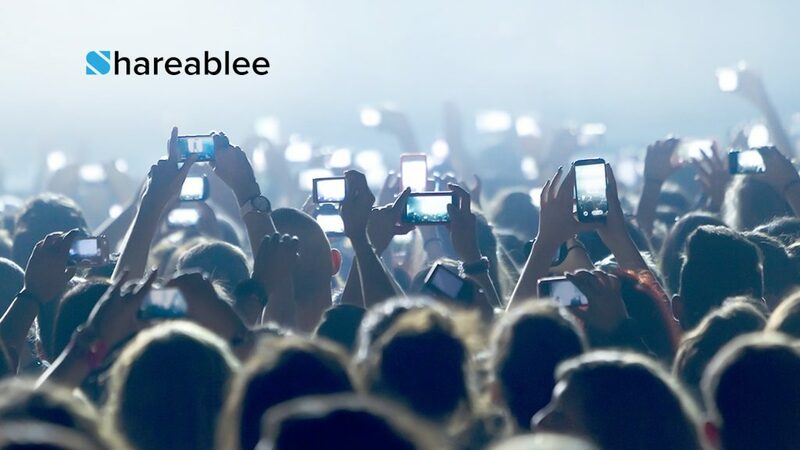 By using Microsoft’s Azure, Shareablee can now run complex database graphing on-demand, making true audience de-duplication possible in real-time. “We at Microsoft are so excited to continue powering Shareablee as they push big data innovation boundaries; it’s why we love finding disruptive startups in our Accelerator program so much,” said Hanan Lavy, Managing Director, Microsoft Accelerators at Microsoft Corp.
As a rising superpower in audience-based social media measurement for media publishers, agencies, and brands, Shareablee can dramatically improve total video and content impact and audience engagement. Shareablee is a Facebook Media Solutions partner, was selected to be a part of the Microsoft Big Data Accelerator program in 2016.